All Tina Turner items listed below are authentic and very limited. We do not carry multiple items. All prices and availability are subject to change. All prices include shipping and handling for all USA customers. All other destinations will require actual shipping cost to complete transaction. Have a question? Ask us before purchasing the item. Thank You. 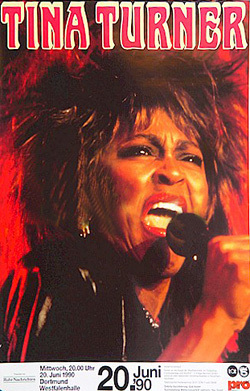 Description: Tina Turner 8x10 Color Concert Photo. 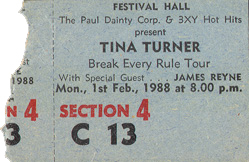 Signed by Tina Turner in silver paint pen. Description: 1985 Tina Turner Private Dancer Tour Book. Live concert and off stage photos. Description: Tina Turner 1979 Dusseldorf Germany Original Concert Poster. Size 24x36. Item in mint condition. Description: Tina Turner 1990 Dortmund Germany Original Concert Poster. Size 24x34. Item in mint condition. Description: Stub in VG+ condition. Description: Stub in Near Mint condition. Extra large ticket 9x7 full color.